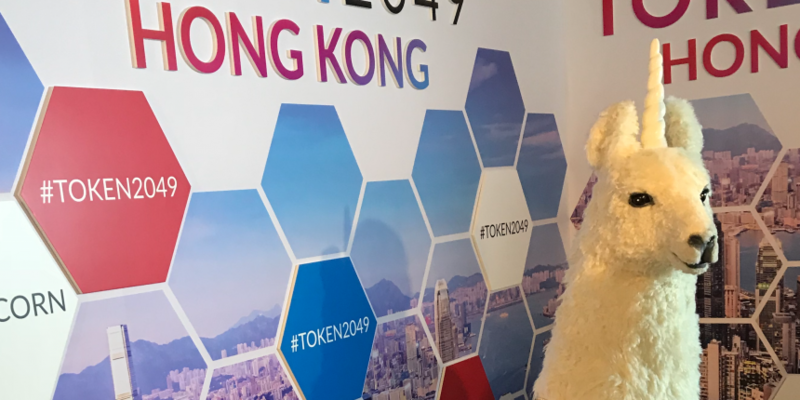 Far East dealers in crypto assets have been on the receiving end of severe regulation and yet the region appears undaunted – at least, that’s if the Token 2049 Hong Kong conference is any indication. Indeed, at day one of the event Tuesday, there wasn’t much evidence of the so-called “crypto winter” being mooted in the west. In fact, China’s “tokenomics” movement appears to be in good health, even with the outright ban on ICOs and trading on exchanges. That’s not to say that the market hasn’t been affected, though. On the contrary, one of the big concerns the Chinese government had about ICOs to begin with was the ease with which crypto tokens might facilitate money laundering, and since the ban, there’s been a lot of underground, modified ICO activity in China, said Jack Lu, founder and CEO of Wanchain. “It may have increased tenfold since the ban,” he said. According to Lu, the result is that China now has a credibility crisis. While the government recognizes that blockchain technology in some form or other could provide a solution, it is left with a proliferation of the very activity it intended to stamp out. How all this plays out is anyone’s guess. But blockchain technology in the form of private, tokenless deployments is welcome in China, said Lu, whose firm is working on interoperability between such networks. Then there’s the large amount of money and effort that Baidu, Alibaba and Tencent have channelled into the blockchain space. Lu even went so far as to mull a future where the two trends might have come to a head. Elsewhere, a panel entitled “Post ICO – the future of venture capital” took a brazen look at the more unique dynamics of the crypto-investing universe: namely, how investors manage active portfolios that influence the public market. Peter Vessenes, former founder of the Bitcoin Foundation and managing director at New Alchemy, which only invests in tokens, talked about the immediate liquidity in crypto markets, as opposed to VC investments. “There are a maximum number of trades a VC can do,” said Vessenes, adding that his firm takes positions, but that trading in and out of tokens was something portfolio firms have shown a greater preference for. Details were also provided on each firms’ strategy. David Chang, managing partner at MindWorks Ventures, for example, said his maxiumum exposure to tokens would be between 10 to 15 percent, with an average investment horizon of about seven years. However, Jason Fang, managing partner, Sora Ventures, said it depends on the jurisdiction: Chinese deals are very different from US deals, he said, which tend to be longer term. “China, you try and get the best deal and when it’s listed you just dump it. If you don’t dump it someone else will dump it,” he said, speaking again to the region’s gray market dynamic. But if China was the focus for much of the day, talks also focused on a very different narrative in Japan. Mike Kayamori, CEO at Quoine, the exchange group and regulated ICO platform, was perhaps most vocal in speaking to the country’s vibrant crypto economy. Prior to holding his own ICO (with $105 million raised in November last year), Kayamori claims he sat down with Japan’s watchdog, the FSA, in what was a collaborative engagement. “What China has banned, Japan has embraced,” said Kayamori. Since regulation was passed that enables token issuers and exchanges to receive official licenses, there have been 90-plus applicants waiting to register, he said. However, he noted that gaining a licence involves KYC/AML checks, segregation of customers’ assets and employing an independent auditor. And Japan is not without its growing pains. All 90 applicants have been put on hold for the foreseeable future, as the Japanese government deals with the blowback of January’s Coincheck hack, Kayamori noted. “Mt.Gox in 2014 and now Coincheck in 2018 – despite all these guidelines this happened again. But I do think it’s all temporary,” said Kayamori, hinting at his belief the market is likely to bounce back.